Home >> Providers >> Courtney Sellers, P.A.-C.
Courtney Sellers joined North Atlanta Primary Care in 2018 and is seeing patients at our West Paces location. She graduated from the University of Georgia with a Bachelor of Business Administration in Marketing and a Bachelor of Science in Dietetics. She attended Mercer University’s Physician Assistant program as a member of their AHEC program, completing her clinical training in rural Georgia with a focus on underserved primary care. She completed a primary care residency at the Malcom Randall VA hospital at the University of Florida. 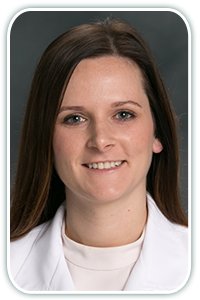 Courtney has an interest in chronic disease management, medical nutrition therapy, and preventative medicine. She is a member of the American Academy of Physician Assistant, the Academy of Nutrition and Dietetics, and the Obesity Medicine Association. Courtney is an Atlanta native, and is so glad to be home after years spent away. She enjoys walks with her golden lab, Blanche, spending time with her family and friends, and finally being in the same city as her fiancé, Chris.